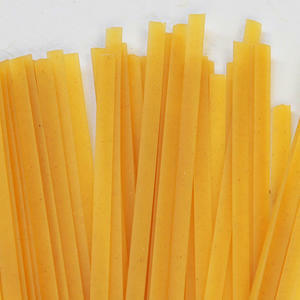 Fettuccine (or, "little ribbons") is a long, flat Italian noodle approximately a quarter inch wide. Fettuccine is most famous in the U.S. for the classic dish, Fettuccine Alfredo. Because of its width and sturdy bite, fettuccine can handle heavier cream and tomato sauces, yet is equally delicious with a simple toss of olive oil and lemon.